I have been on the receiving end of the generosity of lots of knitters, and am finally able to show my appreciation by knitting all this lovely yarn up. 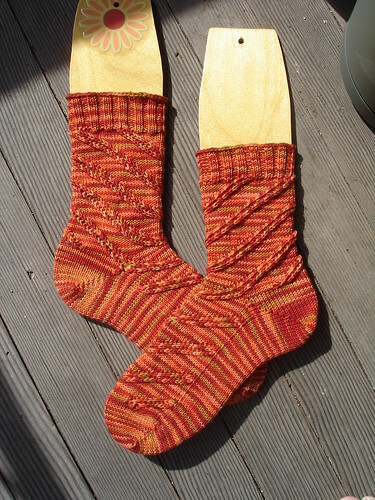 First off, here are my Anastasia Socks in Fred Flintstone, which I bought from a lovely Raveler ages ago, when it wasn't available on the site (though it is at the moment). 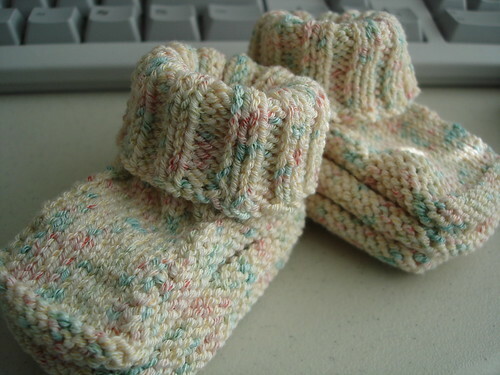 These are my first toe-up socks, and while I liked the short-row toe, I'm not wild about short-row heels or worrying about how stretchy my bindoff will be. To me, grafting a toe is way more fun and stress-free than binding off the top of a sock. 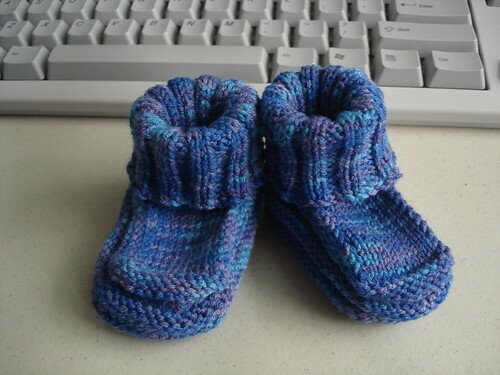 I *love* how the yarn striped/spiraled, and even though the gauge ended up being ridiculously tight for medium weight yarn, the socks fit well and I would do it all again. And, finally, one of my first actions on Ravelry way back in August, 2007, was to come across the BMFA Peaseblossom colorway and ask if anyone had a skein they would like to trade. A lovely club member hadn't knit hers up and traded me for it, and I am finally, finally using it. 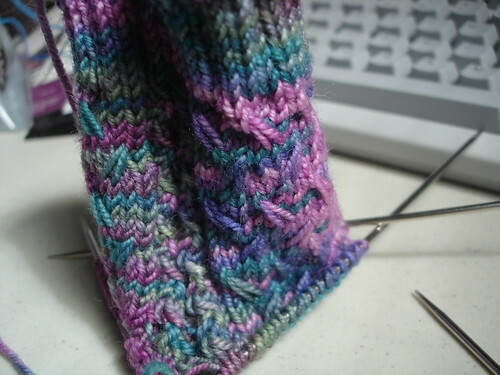 This is Mad Color Weave, which I'm making as part of the Quarter 2 Socks that Rawk Knitalong. The base yarn feels different than more recent STR -- more like Koigu, seems to me. Progress on Apres Surf is continuing, but slowly -- I did rip and re-knit, and am in the increase part of the body. I'm giving most of my attention to socks right now, but I'd like to be able to wear Apres Surf this spring, so I should be working on it more. I'll try to find the piece of paper that I was keeping track of increases on and get back to work on it.